The historian Snorri Sturluson, writing in the 1220s, based his Ynglinga Saga on accounts of “wise people” and most spesifically on the poem Ynglingatal by Thiódolf the Wise, who composed this poem towards the end of the 9th century. Ynglinga Saga tells the legend of the royal Ynglinga lineage, beginning with the arrival of the Aesir in Sweden and Freyr´s domain in Uppsala in ancient Svíthiód, the land of the Svear tribe, and then moving up 30 generations until Halfdan the Black, who was born ca 810 A.D. Halfdan was to father Harald Hárfagri, who came to unite the 30 tribes of Norway (and caused the settling of Iceland by the emigration of his enemies from Norway). Thirty generations – that could easily lead us back to 700-500 BC. We hear of the lives and rules and deaths of one king after the other, all ruling from the great and sacred site of Uppsala, where people would gather from all over Sweden for celebrations, sacrifice and parliament (“Thing”). Having reached the fifth and sixth centuries AD, we start to hear of the so-called “Sea-kings”, landless Vikings who raided the coasts of Sweden, Finland and the Baltic – and sometimes came to rule the Swedish tribes. 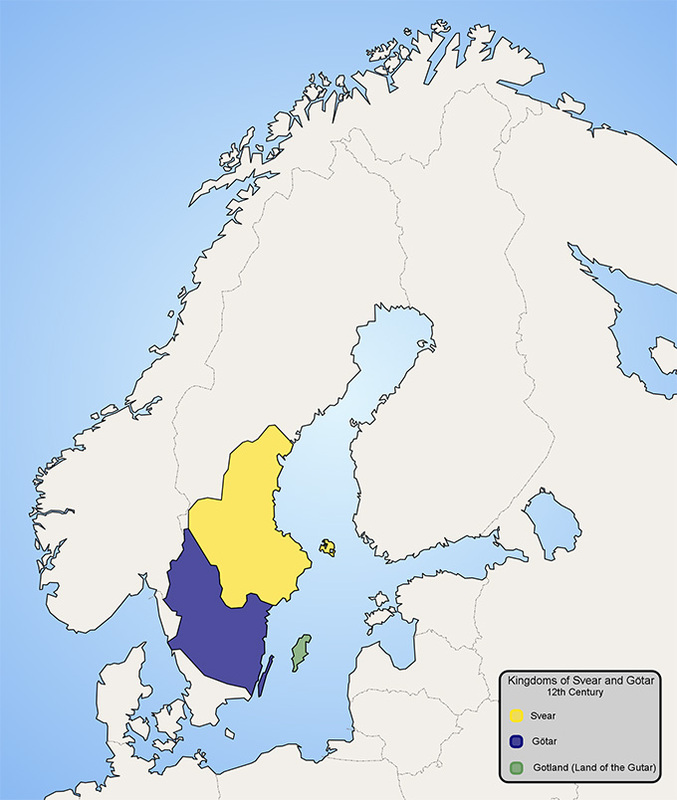 Before Ingjald the Bad Ruler, who may have lived sometime between 500-700 AD, Sweden also consisted of many tribes and kingdoms, the most important of which were Svíthiód, Götaland, Gotland and Scania. Ingjald got it into his head that he should be king of all Swedes, but did not count on Ivarr Rules Widely, the king of Scania (south-east Sweden) and descendant of the Skioldunga lineage that once ruled all of Denmark from the seat of Lejre in Zealand. The defeat of Ingjald, the last Ynglinga king to rule at Uppsala, caused his son, Ólaf the Tree-Feller, to flee westwards to Norway with a large retinue of men. There, his descendants came to rule the kingdom of Vestfold in Norway, until Harald Hárfagri united the Norwegian tribes and created a nation out of Norway during the 860s. Eystein, King Adils’ son, ruled next over Sweden, and in his lifetime Rolf Krake of Lejre fell. In those days many kings, both Danes and Northmen, ravaged the Swedish dominions; for there were many sea-kings who ruled over many people, but had no lands, and he might well be called a sea-king who never slept beneath sooty roof-timbers. There was a sea-king called Solve, a son of Hogne of Njardo, who at that time plundered in the Baltic, but had his dominion in Jutland. He came with his forces to Sweden, just as King Eystein was at a feast in a district called Lofond. Solve came unexpectedly in the night on Eystein, surrounded the house in which the king was, and burned him and all his court. Then Solve went to Sigtun, and desired that the Swedes should receive him, and give him the title of king; but they collected an army, and tried to defend the country against him, on which there was a great battle, that lasted, according to report, eleven days. There King Solve was victorious, and was afterwards king of the Swedish dominions for a long time, until at last the Swedes betrayed him, and he was killed. Yngvar, who was King Eystein’s son, then became king of Sweden. He was a great warrior, and often lay out with his warships; for the Swedish dominions were much ravaged then by Danes and East-country men. King Yngvar made a peace with the Danes; but betook himself to ravaging the East country in return. One summer he went with his forces to Estland, and plundered at a place called Stein. The men of Estland came down from the interior with a great army, and there was a battle; but the army of the country was so brave that the Swedes could not withstand them, and King Yngvar fell, and his people fled. 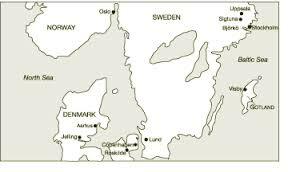 He was buried close to the seashore under a mound in Estland; and after this defeat the Swedes returned home. 37. OF ONUND THE ROADMAKER. Onund was the name of Yngvar’s son who succeeded him. In his days there was peace in Sweden, and he became rich in valuable goods. King Onund went with his army to Estland to avenge his father, and landed and ravaged the country round far and wide, and returned with a great booty in autumn to Sweden. In his time there were fruitful seasons in Sweden, so that he was one of the most popular of kings. Sweden is a great forest land, and there are such great uninhabited forests in it that it is a journey of many days to cross them. Onund bestowed great diligence and expense on opening the woods and cultivating the cleared land. He made roads through the desert forests; and thus cleared land is found all through the forest country, and great districts are settled. 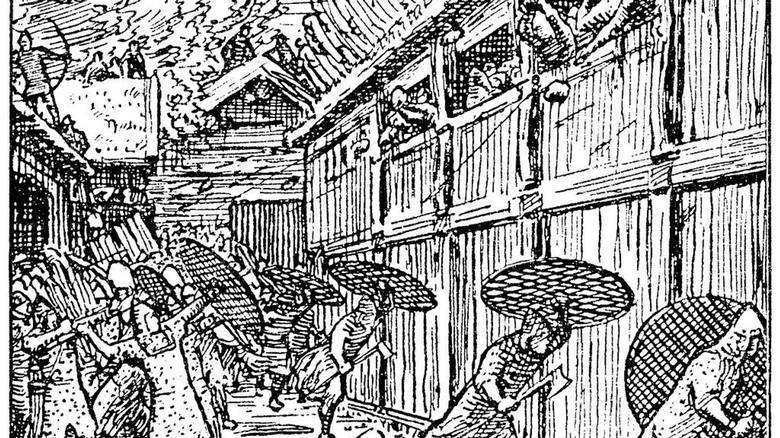 In this way extensive tracts of land were brought into cultivation, for there were country people enough to cultivate the land. Onund had roads made through all Sweden, both through forests and morasses, and also over mountains; and he was therefore called Onund Roadmaker. He had a house built for himself in every district of Sweden, and went over the whole country in guest-quarters. Onund had a son called Ingjald, and at that time Yngvar was king of the district of Fjadryndaland. Yngvar had two sons by his wife — the one called Alf, the other Agnar — who were about the same age as Ingjald. Onund’s district-kings were at that time spread widely over Sweden, and Svipdag the Blind ruled over Tiundaland, in which Upsal is situated, and where all the Swedish Things are held. There also were held the mid-winter sacrifices, at which many kings attended. One year at midwinter there was a great assembly of people at Upsal, and King Yngvar had also come there with his sons. Alf, King Yngvar’s son, and Ingjald, King Onund’s son, were there — both about six years old. They amused themselves with child’s play, in which each should be leading on his army. In their play Ingjald found himself not so strong as Alf, and was so vexed that he almost cried. 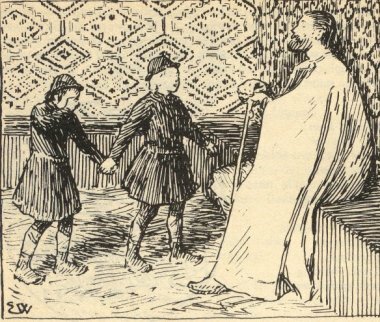 His foster-brother Gautvid came up, led him to his foster-father Svipdag the Blind, and told him how ill it appeared that he was weaker and less manly than Alf, King Yngvar’s son. Svipdag replied that it was a great shame. The day after Svipdag took the heart of a wolf, roasted it on the tongs, and gave it to the king’s son Ingjald to eat, and from that time he became a most ferocious person, and of the worst disposition. When Ingjald was grown up, Onund applied for him to King Algaut for his daughter Gauthild. Algaut was a son of Gautrek the Mild, and grandson of Gaut; and from them Gotland (Gautland) took its name. King Algaut thought his daughter would be well married if she got King Onund’s son, and if he had his father’s disposition; so the girl was sent to Sweden, and King Ingjald celebrated his wedding with her in due time. 39. OF KING ONUND’S DEATH. King Onund one autumn, travelling between his mansion-houses, came over a road called Himmenheath, where there are some narrow mountain valleys, with high mountains on both sides. There was heavy rain at the time, and before there had been snow on the mountains. A landslip of clay and stones came down upon King Onund and his people, and there he met his death, and many with him. Then Ingjald, King Onund’s son, came to the kingdom. The Upsal kings were the highest in Sweden among the many district-kings who had been since the time that Odin was chief. The kings who resided at Upsal had been the supreme chiefs over the whole Swedish dominions until the death of Agne, when, as before related, the kingdom came to be divided between brothers. After that time the dominions and kingly powers were spread among the branches of the family as these increased; but some kings cleared great tracts of forest-land, and settled them, and thereby increased their domains. Now when Ingjald took the dominions and the kingdom of his father, there were, as before said, many district-kings. King Ingjald ordered a great feast to be prepared in Upsal, and intended at that feast to enter on his heritage after King Onund his father. He had a large hall made ready for the occasion — one not less, nor less sumptuous, than that of Upsal; and this hall was called the Seven Kings Hall, and in it were seven high seats for kings. Then King Ingjald sent men all through Sweden, and invited to his feast kings, earls, and other men of consequence. To this heirship-feast came King Algaut, his father-in-law; Yngvar king of Fjadryndaland, with his two sons, Alf and Agnar; King Sporsnjall of Nerike; King Sighvat of Aattundaland: but Granmar king of Sodermanland did not come. Six kings were placed in the seats in the new hall; but one of the high seats which Ingjald had prepared was empty. All the persons who had come got places in the new hall; but to his own court, and the rest of his people, he had appointed places at Upsal. It was the custom at that time that he who gave an heirship-feast after kings or earls, and entered upon the heritage, should sit upon the footstool in front of the high seat, until the full bowl, which was called the Brage-beaker, was brought in. Then he should stand up, take the Brage-beaker, make solemn vows to be afterwards fulfilled, and thereupon empty the beaker. Then he should ascend the high seat which his father had occupied; and thus he came to the full heritage after his father. Now it was done so on this occasion. When the full Brage-beaker came in, King Ingjald stood up, grasped a large bull’s horn, and made a solemn vow to enlarge his dominions by one half, towards all the four corners of the world, or die; and thereupon pointed with the horn to the four quarters. Now when the guests had become drunk towards evening King Ingjald told Svipdag’s sons, Gautvid and Hylvid, to arm themselves and their men, as had before been settled; and accordingly they went out, and came up to the new hall, and set fire to it. The hall was soon in a blaze, and the six kings, with all their people, were burned in it. Those who tried to come out were killed. Then King Ingjald laid all the dominions these kings had possessed under himself, and took taxes from them. 41. OF A SEA KING’S MARRIAGE. When King Granmar heard the news of this treachery, he thought the same lot awaited him if he did not take care. The same summer King Hjorvard, who was called Ylfing, came with his fleet to Sweden, and went into a fjord called Myrkva-fjord. When King Granmar heard this he sent a messenger to him to invite him and all his men to a feast. He accepted it willingly; for he had never committed waste in King Granmar’s dominions. When he came to the feast he was gladly welcomed. In the evening, when the full bowls went round, as was the custom of kings when they were at home, or in the feasts they ordered to be made, they sat and drank together, a man and woman with each other in pairs, and the rest of the company sat and drank all together. But it was the law among the vikings that all who were at the entertainment should drink together in one company all round. King Hjorvard’s high seat was placed right opposite to King Granmar’s high seat, and on the same bench sat all his men. King Granmar told his daughter Hildigunn, who was a remarkably beautiful girl, to make ready to carry ale to the vikings. Thereupon she took a silver goblet, filled it, bowed before King Hjorvard, and said, “Success to all Ylfinger: this cup to the memory of Rolf Krake” – drank out the half, and handed the cup to King Hjorvard. He took the cup, and took her hand, and said she must sit beside him. She said that is not viking fashion to drink two and two with women. Hjorvard replied that it were better for him to make a change, and leave the viking law, and drink in company with her. Then Hildigunn sat down beside him, and both drank together, and spoke a great deal with each other during the evening. 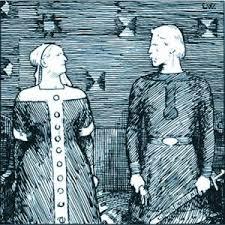 The next day, when King Granmar and Hjorvard met, Hjorvard spoke of his courtship, and asked to have Hildigunn in marriage. King Granmar laid this proposal before his wife Hilda, and before people of consequence, saying they would have great help and trust in Hjorvard; and all approved of it highly, and thought it very advisable. And the end was, that Hildigunn was promised to Hjorvard, and the wedding followed soon after; and King Hjorvard stayed with King Granmar, who had no sons, to help him to defend his dominions. The same autumn King Ingjald collected a war-force, with which he intended to fall upon Granmar and Hjorvard; but when they heard it they also collected a force, and Hogne, who ruled over East Gotland, together with his son Hildur, came to their assistance. Hogne was father of Hilda, who was married to King Granmar. 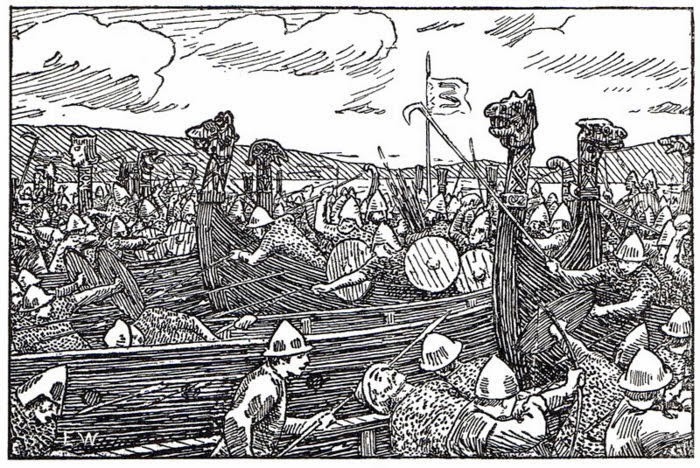 King Ingjald landed with his army, which was by far the most numerous. A battle began, which was very sharp; but after it had lasted a short time, the chiefs who ruled over Fjadryndaland, West Gotland, Nerike, and Aattundaland, took to flight with all the men from those countries, and hastened to their ships. This placed King Ingjald in great danger, and he received many wounds, but escaped by flight to his ships. Svipdag the Blind, Ingjald’s foster-father, together with his sons, Gautvid and Hylvid, fell. Ingjald returned to Upsal, very ill-satisfied with his expedition; and he thought the army levied from those countries he had acquired by conquest had been unfaithful to him. There was great hostility afterwards between King Ingjald and King Granmar, and his son-in-law King Hjorvard; and after this had continued a long time the friends of both parties brought about a reconciliation. The king appointed a meeting, and concluded a peace. This peace was to endure as long as the three kings lived, and this was confirmed by oath and promises of fidelity. The spring after, King Granmar went to Upsal to make offering, as usual, for a steady peace. Then the foreboding turned out for him so that it did not promise him long life, and he returned to his dominions. The autumn after, King Granmar and his son-in-law Hjorvard went to a feast at one of their farms in the island Sile. 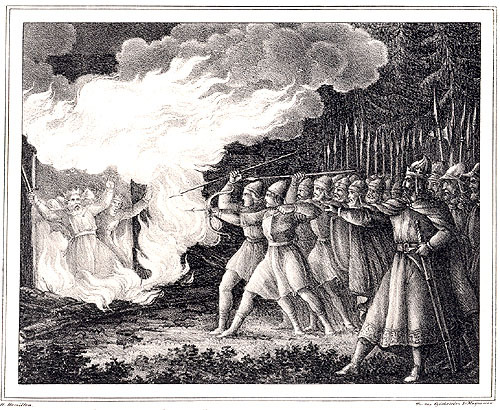 When they were at the entertainment, King Ingjald came there in the night with his troops, surrounded the house, and burnt them in it, with all their men. Then he took to himself all the country these kings had possessed, and placed chiefs over it. King Hogne and his son Hildur often made inroads on horseback into the Swedish dominions, and killed King Ingjald’s men, whom he had placed over the kingdom which had belonged to their relation Granmar. This strife between King Ingjald and King Hogne continued for a long time; but King Hogne defended his kingdom against King Ingjald to his dying day. King Ingjald had two children by his wife – the eldest called Ása, the other Olaf. Gauthild, the wife of Ingjald, sent the boy to his foster-father Bove, in West Gotland, where he was brought up along with Saxe, Bove’s son, who had the surname of Flette. It was a common saying that King Ingjald had killed twelve kings, and deceived them all under pretence of peace; therefore he was called Ingjald the Bad Ruler. He was king over the greater part of Sweden. He married his daughter Ása to Gudrod king of Scania; and she was like her father in disposition. Ása brought it about that Gudrod killed his brother Halfdan, father of Ivarr Rules Widely; and also she brought about the death of her husband Gudrod, and then fled to her father; and she thus got the name also of Ása the Bad Ruler. Ivarr Rules Widely came to Scania after the fall of his uncle Gudrod, and collected an army in all haste, and moved with it into Sweden. Ása had gone to her father before. King Ingjald was at a feast in Raening, when he heard that King Ivarr’s army was in the neighbourhood. Ingjald thought he had not strength to og into battle against Ivarr, and he saw well that if he betook himself to flight his enemies would swarm around him from all corners. He and Ása took a resolution which has become celebrated. They drank until all their people were dead drunk, and then put fire to the hall; and it was consumed, with all who were in it, including themselves, King Ingjald, and Ása. Ivarr Rules Widely subdued the whole of Sweden. He brought in subjection to himself all the Danish dominions, a great deal of Saxland, all the East Country, and a fifth part of England. From his race the kings of Sweden and Denmark who have had the supreme authority in those countries, are descended. After Ingjald the Bad Ruler the Upsal dominion fell from the Yngling race notwithstanding the length of time they could reckon up the series of their forefathers.